Did Jean Claude Van Damme Ad Cause Volvo Truck Sales To Rise 31%? 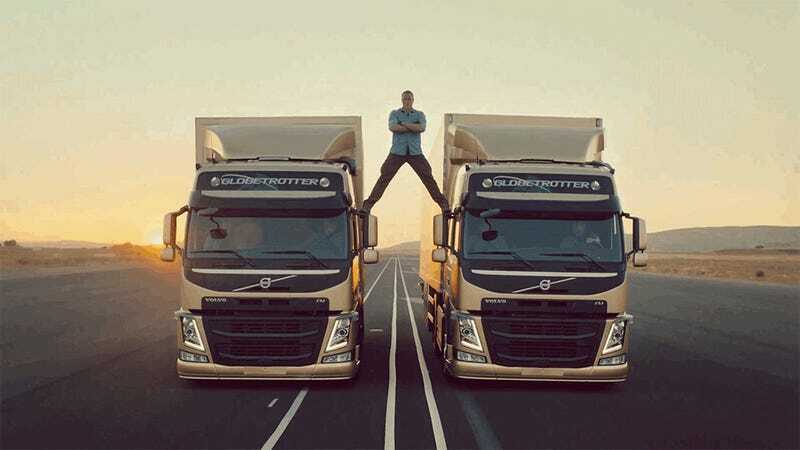 Will one amazing Jean Claude Van Damme ad save Volvo Trucks? No, but it doesn't seem to hurt. That video has now hit 60 million views and, while 59.9 million of them might not be in the market for a new rig, that would still leave a ton of potential buyers. Per the Wall Street Journal? Volvo Truck, one of four wholly owned truck brands in the Volvo Group, delivered 31% more trucks in November than it did in the prior year, representing a sizable gain for a company selling high-dollar goods in economic times that remain challenging. Deliveries for the group's Mack, Renault and UD truck brands remained largely flat compared with last year. Can you give all of the credit to JCVD? Of course not. Yet it got us talking about electronically controlled steering. I've been through Delaware a few times but I'm not entirely convinced that it's a place where people live and not just an empty field full of banks. Of course, banks are people too. Fisker went bankrupt and then was purchased by the son of Hong Kong's richest man and, as a part of that deal, they're going to have to build Karmas in the United States. However, they're not required to build other cars in the U.S., which means the former GM plant touted as the home of new American green jobs is probably never going to see a Fisker built there. "I'm a glass-half-full guy, but it's hard to see how this ends up with Fisker building cars in Delaware," Senator Tom Carper (D-DE) told Bloomberg. The Karma, it should be noted, was never actually built here but was instead built in Finland. Yesterday, we were talking about how the U.S. was shipping more cars to Asia. Now we should talk about the cars that Asia is sending to us. Japanese exports were up for the ninth month in a row. Where's that volume coming from? As Automotive News reports, car shipments to the U.S. and China are up 13.2% and 185%, respectively. That's the good side of the weak yen for Japanese automakers, although it's been slow to materialize in anything but repatriated profits. The longer you wait to buy a car, the better off you'll be, reports Chris Woodyard, as dealers are trying to move whatever they have left. He's got a rundown of all the deals, but the biggest value may be at Honda where they're offering $3K to dealers for every car over 2012 they sell. "As the year comes to a close we are looking to our dealers to 'best themselves,' " says John Mendel, executive vice president of Honda of America, in a statement. "We have received nothing but positive feedback from our dealers about the program." GM CEO Dan Akerson took over the company at a rough time and, no matter what Peter De Lonobodygivesashit says, the company is better at the end of his tenure than the beginning. Akerson left the world of private equity behind when he took over GM in 2010. He and his wife, Karin — quietly and publicly — have made significant monetary contributions in the city to organizations including the Capuchin Soup Kitchen and Habitat for Humanity Detroit. Just this week, he doubled a personal donation to a Detroit agency that feeds the needy. "I just think if the company does well, it's the opportunity for you to do good," Akerson said. "We have been blessed. If you go out and see the good it does, it makes you feel better about life. On December 20, 1989, the provocative filmmaker Michael Moore's satirical documentary "Roger & Me" opens in theaters across the United States. (It had made a brief tour of film festivals earlier that year, before it had a distributor.) The film chronicled Moore's unsuccessful attempts to meet Roger B. Smith, the chairman and chief executive of General Motors, who had presided over the closing of 11 factories in Flint, Michigan, during the 1970s and 80s. As a result, nearly 40,000 people lost their jobs, and Moore wanted to interview Smith about the city's subsequent decline; Smith, perhaps understandably, chose to avoid that conversation, and his dodges and evasions provided plenty of grist for the filmmaker's mill. Neutral: Will They Ever Build A Fisker In The US? Place your bets.